There's nothing more annoying than having dry and itchy skin after you shave. You can spend a whole day scratching at your neck and face and wind up with red, irritated skin as a result. There are many reasons why shaving can cause irritated skin, and even more ways to help prevent or treat irritated skin after shaving. However, if you want to know how you can shave without worrying about irritated skin afterwards, we recommend you start with these five basic tips. It is important that you get your facial hair wet before shaving, so you can avoid getting razor burn and other types of irritated skin. You can get your hair wet by showering or taking a bath before shaving, and if you don't want to do that you can wash your face and lightly press a moist towel for 5 to 10 minutes. It is important to use warm water, as water that is too hot or too cold that can make your skin irritated even before you start to shave. Human hair can absorb water up to around one-third of its normal volume, and when it absorbs that much water it becomes softer and weaker. It also makes your hair stand up from your skin, which makes it easier for the razor to cut your hair. This way you aren't applying as much pressure with your hand as you run the razor across your skin. A lighter touch when you shave helps prevent things like razor burn. The water and steam from a warm shower also helps soften, moisturize and fortify your skin just before shaving. Having soft and hydrated skin helps keep it protected from any razor burn or shaving rash after the fact, as well as keeping your skin healthy and strong to prevent ingrown hairs. It also helps your razor run more smoothly against your skin. While water can help provide some lubrication to your skin, it is best to use a product specifically designed to do that job for you. That's where shaving lubricants like creams or gels come in. 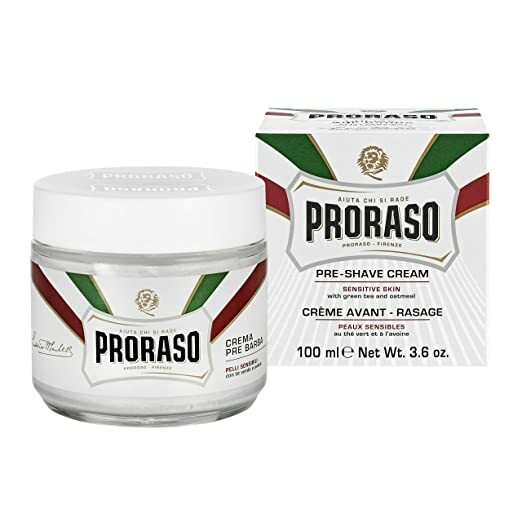 The best shaving lubricant will stay in close contact with your skin, so your razor glides and slips along your skin instead of dragging and catching on it. This means you want something that turns into more of a thick and creamy lather than a light, puffy foam. The lather helps seal in the moisture from your shower or face wash into the hairs, helping them stay soft, weaker and upright so they're easier to cut. That way your razor doesn't catch on thicker parts of your facial hair, and you're not pressing or pulling the blades as hard against your skin. Good quality shaving lubricants also come with natural vitamins and minerals to promote good skin health, such as aloe vera and other ingredients. It's a good idea to use a shaving brush to apply the cream or gel to your face. The brush helps lightly exfoliate your skin to get it ready for shaving, and also stirs up the hairs so they're raised from the skin. After using a brush, let the foam sit on your skin for a few minutes before shaving — it gives the soothing and fortifying ingredients more time to soften your hairs and skin. Pressing or dragging a razor against dry, unprepared and non-lubricated skin is just one of the common causes of irritated skin from shaving. Another is using a razor that is dull or dirty — or both — during the shave itself and between shaving. It is important to make sure you either keep your razor blades clean and sharp, or replace them with ones that are. When you use a razor, it accumulates some of the oil, dirt, grime and debris that builds up on your skin and in your hair. The more you use the same blade without cleaning it, the more you are pressing and driving all of that dirt into your skin with a sharp blade, potentially causing irritation and infection. During a shave, you should run the razor under hot water every two or three swipes to clean any build-up from the blades. After shaving, you should run it under hot water with high pressure jets for 10 seconds. The pressure clears debris, and the heat gets rid of bacteria. Dull razors can be just as bad. The less sharp the blades are, the more difficult it is to cleanly cut your facial hair. This makes you use the blades on the same areas of skin more than once, and you have to press it against your skin harder to make sure you don't miss any spots. Cleaning the blades after a shave helps prevent cut hairs and debris from creating friction that dulls the edges faster, but you should also dry the blades with a towel or hair dryer to avoid rusting. When you shave, always make sure you shave in the direction that your facial hair grows — this is called shaving with the grain, and it means shaving with downward strokes. You might have heard that shaving against the grain creates a closer shave, and while that is technically true it is also far more likely to cause irritated skin. This is because when you shave with the grain, the blades are passing in the same direction that the hairs already grow. It creates less resistance as you shave, which as we have mentioned already is key to avoiding irritated skin. However, when you shave against the grain, it causes the blades to pull at the hair in the opposite direction. This can damage your pores and increase the chance of irritated skin from the damage or ingrown hairs. When you are done shaving and before you clean your blades, you should always apply a good quality aftershave to your skin. You can get aftershave in a cream, gel, or liquid balm, and they come with a variety of benefits that helps prevent your skin from developing irritation, acne, or ingrown hairs later on. While traditional aftershaves used to contain alcohol as antiseptic, alcohol is also very harsh on your skin and can irritate it by itself. It is better to stick with aftershave that uses ingredients that are not harsh (sulfates, petroleum jelly, etc.) but instead use natural ingredients to soothe, hydrate and strengthen your skin's health. The best examples of natural ingredients are extracts and oils that come from seeds, plants, and minerals: olive, avocado, coconut, jojoba, tea tree, aloe vera, almond, grapeseed, and other oils. They all contain naturally occurring vitamins, minerals and chemicals that disinfect your skin, as well as moisturize it and promote the growth of good, healthy and strong skin cells. That way any part of your shaving routine that might cause irritation can be mitigated by using an effective aftershave. Paul Agelidis has been the founder and owner of Revolucion, a Canadian cigar, tobacco and men's gift shop in Vancouver, since 2005. For the last decade Paul has worked very hard to become an expert in tobacco products, men's care, travel & accessories, body & bath, and gifts & home. Prior to 2005, from 1997 – 2005 Paul worked in the wholesale cigar industry and travelled to the annual cigar trade show (Habanos Festival every February). He loves to share his tips with others who are looking to achieve a complete lifestyle with the finer things in life.